WordPress has recently released version 3.1. Here I’ll give you tips on two new features that you’ll definitely want to know about to make your blog better, plus a rundown on all the new whizbangs you’ll want to think about taking advantage of later. It’s a great way to get to the most frequently used Admin areas while in page view, without having to flip back to the Dashboard or Admin view. Hover your mouse over each section to see all the options of where you can go quickly. There are ways to disable the new Admin Bar, including a couple of plugins. But, I suggest you keep it for a while and see how easy it makes your maintenance chores. The folks using WordPress.com have had this feature for a while now and they generated a lot of positive feedback on it. Referencing a link to another post or page on your site is great for both your readers and SEO. One of my favorite ways to use that feature is to provide links to other relevant content at the end of my posts. I do that with a nice plugin. 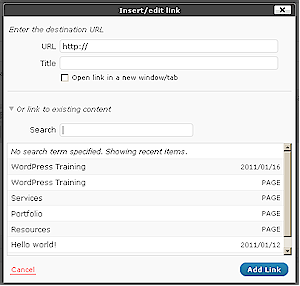 But, 3.1 now has a new Insert Link feature that will replace the plugin. To use it, be in the Visual View mode when creating a post or page. Highlight some text you’d like to link and you’ll see the new pop-up box. At the top is the usual fields where you input the URL of the link and the title. And now there is a checkbox to “Open link in a new window/tab” which you’ll definitely want to use for external links. Below that is a line that states “Or link to existing content” and it has a little down arrow to the left. Click it to see the rest of the options. Enter your Search word or phrase and the fields below will populate with relevant content from your site. NOTE: You will not see this new pop-up if you are using a non-standard text editor, such as the advanced ones you can get as a plugin. Depending on your theme, you may see less panels, or modules, when you are using your text editor to create a post or page. The ones that disappeared for me were Excerpt, Trackbacks, Custom Fields, and Discussion. WordPress 3.1 comes loaded with a bunch of new goodies, but you may not be able to take advantage of all of them right away. Some are theme-dependant, meaning that you can’t use them if your theme doesn’t support them. Here’s a run down on a few that may have you looking for a new theme or theme upgrade. You’ll probably start seeing a bunch of new themes come out soon to take advantage of all that 3.1 offers. Chief among these will be themes that offer Post Formats. It’s basically an improvement on the wildly popular Categories feature offered in magazine styled themes. It will allow you to customize the look of posts to be styled different ways. 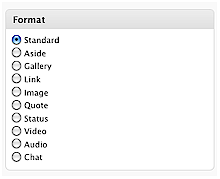 For example, you could have posts styled specifically for videos, image galleries, or even chats. This one change may cause me to create a new theme for BlogAid. Before changing to the current design back in November, I tried like heck to make a magazine style theme work, but I found the Category limitations too confining for the breadth of info I carry on this site. I’ll keep you posted on new themes that take advantage of Post Formats and let you know how they work. Any time WordPress comes out with a new major release, it has the potential to send your theme into a tailspin. You can recognize a major release by the number changes. For example, these are major release version numbers: 2.9, 3.0, 3.1. These are minor release version numbers. 3.0.1, 3.0.2 and so on. It is always recommended that you upgrade immediately on any minor releases because most of those are bug or security loophole fixes. You take your chances when you wait to upgrade during a major version release. Yeah, you can wait and let everyone else work out the bugs and wait for your theme to be updated. But, most all of your plugin updates will start pouring in and may or may not work with the older version. And, you leave your site open to hack attacks. So, the real question is, can your theme withstand the upgrade risk either way? That’s why I always recommend that you get your theme from a reputable designer that offers support. It’s likely they will have an updated release available around the time the new WordPress version is published, especially since WordPress is good about letting developers know what’s coming down the pike ahead of time. I’d enjoy hearing about your experiences with the new WordPress 3.1 version. Let me know if you ran into any troubles and what new features you’re using. Thanks for this overview of the WP 3.1 features. I learned about a couple I hadn’t noticed yet. I appreciate the Admin bar but I really like the new insert link feature. It is a very helpful and useful tool! I can verify that it is extremely important to get a WP upgrade as soon as it is available. I was just getting started with my first theme and saw an upgrade available, but I waited a couple of days. Woops! Ended up losing that theme and had to find a new one. But I was glad that it happened early in my experience. I did learn my lesson! Glad you found it helpful, Dee. There are several more features that will be important to developers. I expect to see a bunch of new premium themes come on the market in the next few months that have them. Will post on the blog when that starts happening.